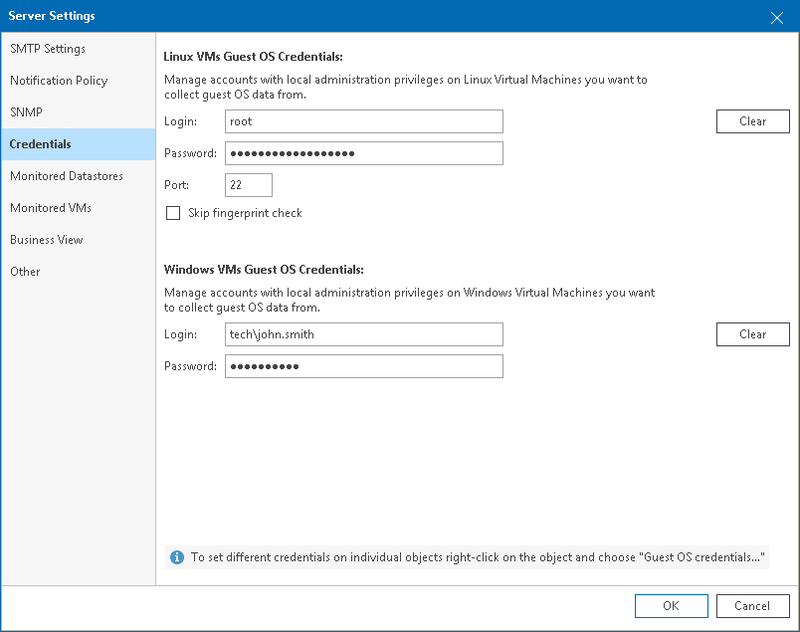 After you connect one or more Microsoft Hyper-V servers, you must specify credentials of an account that will be used to collect data from Windows-based guest OSes on VMs. If you do not specify guest OS credentials, Veeam ONE will not display guest OS data (in particular, data about guest disks) in monitoring dashboards, alarms and reports. If you specify guest OS account credentials at multiple levels, Veeam ONE will use the following order of priority: VM > VM container > Microsoft Hyper-V infrastructure. For example, if account credentials are specified both at the VM and VM container level, Veeam ONE will collect guest OS data using an account set at the VM level. You can specify account credentials at the level of the Microsoft Hyper-V infrastructure. Veeam ONE will use this account to connect to all VMs running on Microsoft Hyper-V hosts unless you specify other credentials for specific VMs or VM containers. In the Server Settings window, open the Credentials tab. In the Login and Password fields, specify credentials of an account that will be used to collect guest OS data from Microsoft Hyper-V VMs. Credentials must be specified in the DOMAIN\Username format. For details on requirements to the account, see Connection to Microsoft Hyper-V VM Guest OS. [For Linux VMs] In the Port field, specify the port number to connect to guest OS. You can specify account credentials at the level of specific VMs or VM containers. This can be helpful if an account specified at the level of the Microsoft Hyper-V infrastructure does not have enough permissions on specific VMs or VM containers. Right-click the necessary VM or VM container and select Guest OS Credentials from the shortcut menu. In the Guest OS Credentials window, specify credentials of an account that will be used to collect guest OS data from Microsoft Hyper-V VMs.